It's no secret that I adore the world of McQuarrie Middle School, which Tom Angleberger created in his Origami Yoda series. 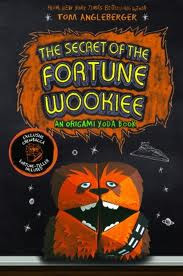 The third book, The Secret of the Fortune Wookiee, delves deeper into the lives of the students as they try to find their way without Dwight and the wisdom of his Origami Yoda. Dwight, to the dismay of his friends, has suddenly become normal. This case file is their effort to convince him to return to being the oddball they have grown to love. Angleberger's opinions on the U.S. education system have become more evident as the series progresses, and Fortune Wookiee ends with a cliffhanger related to the testing mania which has taken over American schools. As a teacher, I appreciate the way he makes this shift away from arts and extracurricular activities something which can be discussed. Students miss art class and drama class; it helps to see their reality reflected in their favorite literature. Heaviness aside, Fortune Wookiee is as fun as the rest of the series, full of Kellan's doodles, Star Wars puns, and giggle-worthy moments. There is a long list of students waiting to read this book after me...I can't wait to discuss with them.